Buying and installing under floor central heating? Then there are good reasons to install Polypipe .If you intend to install an under floor heating system them the selection of a leading brand with aftersales support ongoing is really important. Polypipe plumbing and heating systems are produced from the leading plastic product for hot water, Polybutylene. Long lasting, flexible, light weight and the preferred choice for under floor piping. 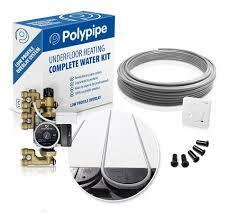 Polypipe manufactures a comprehensive range of products for the UK under floor heating market. Innovative solutions for all under floor heating installations from a single room to a whole house heating system. Polypipe under floor heating is ideal for renovations, room additions or complete new builds. Red panel floor systems for solid screed allows pipework to be laid out in correct spacing’s and hold their positions until the screed is overlaid. These light weight plastic panels make easy work of installing an under floor system prior to screeding. Panels are fast to lay and easy to cut but also save on the volume of sand and cement required to cover. Alternately pipework can be simply clipped down to insulation panels using Fir tree type pipe clips. A range of floating floor panels in different thicknesses allow for installing on timber floor structures including suspended floors and overlaying of existing floors with Polypipe Overlay. When it comes to choosing and installing a new under floor system no matter how small or large then Polypipe should be your first choice. A leading British manufacturer who has led the industry for many years. A company that has been around and will continue to do so which counts when it comes to warranties. Under floor heating is installed beneath the finished floor level so reliability and longevity are so important. Polypipe provides you peace of mind on your heating investment whilst you enjoy the wonderful warmth of all round under floor heating.